UF MBA candidate Patrick Brennan and his commander near the U.S. Embassy in Baghdad. Balancing work, life and school commitments is critical for working professional students pursuing an MBA. The UF MBA Online program provides students with the flexibility to manage their professional commitments while still earning their MBA. 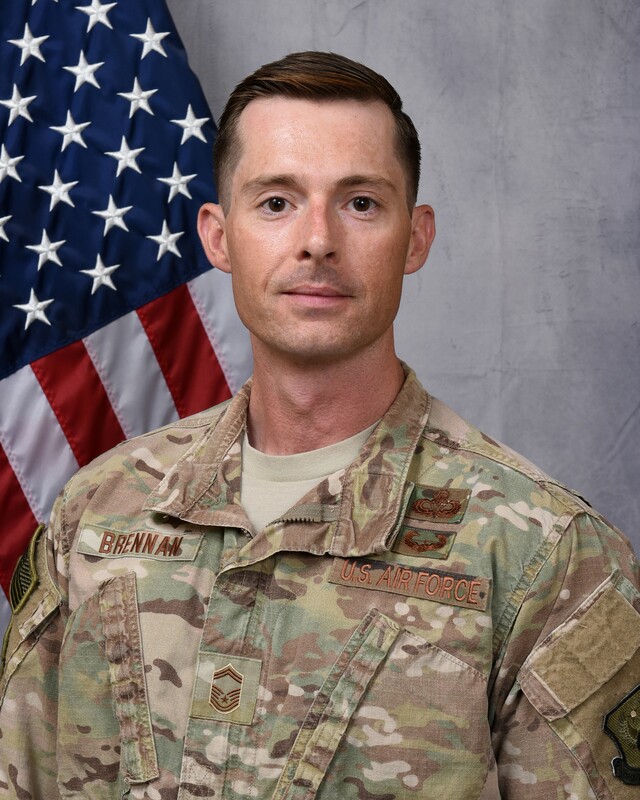 Take it from Patrick Brennan, an active duty military member and current UF MBA Online student, earning an MBA is possible even with a busy schedule. Read more from Patrick about how he balances his MBA studies with his duties as an active duty member of the Air Force. That was the sound of my phone’s messaging software trying to make its connection with Michelle, my UF MBA teammate who was about to present our Organizational Behavior final project to our cohort last semester. I was sitting on a bunk at Taji Air Base, just north of Baghdad, Iraq, trying to make an internet phone call. The call finally went through after what seemed like weeks of waiting. I had a lot riding on this presentation. The standard greeting when you’re trying to talk to someone ten-thousand miles away. “Yeah. Hi. Hi! I can hear you,” she replied a couple of seconds later. There’s a pretty significant delay over such a long distance. Michelle, our other teammate Trisha and I had arranged with our professor days prior for me to call in when it was our turn to present our team project. Our team had worked for weeks over email to write a paper on how to use Organizational Behavior principles to improve the work environment at my home Air Force unit in New York. I’d managed to find a somewhat-stable internet connection somewhere in the middle of Iraq, so that I could listen in as she did an outstanding job presenting our 60-page research paper. After her presentation, I fielded questions our cohort had about our data and conclusions. 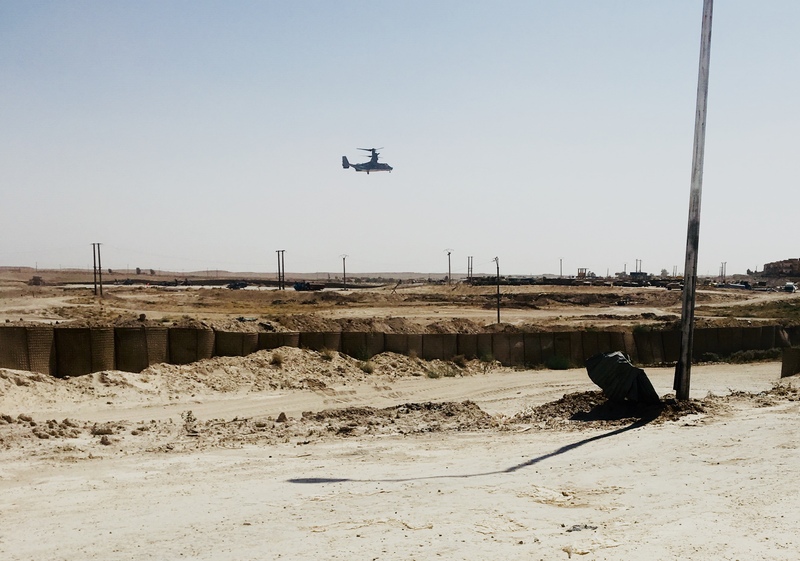 A CV-22 Osprey landing in Syria. Photo by Patrick Brennan. Situations like that are just one of the many challenges I deal with as an active duty military member pursuing an MBA through the University of Florida Warrington College of Business’ hybrid online program. However, the motivation of my team, the support of my cohort, and the unbelievably helpful faculty have made the journey to this point infinitely easier than it otherwise might have been. I joined the U.S. Air Force in 1997 and still am proud to call myself an Airman 21 years later. I enlisted as a weather technician, a job which consisted of recording current weather conditions and providing weather briefings in support of military flights. Over the years, my role has evolved from sitting in a small tower sandwiched between two runways, to becoming a “combat weatherman” or “Grey Beret;” a qualified military parachutist that conducts airborne infiltrations with Army Airborne Infantry to provide weather capabilities during high-intensity conflicts. While I am passionate about my job and, even more importantly, the quality of Airman and Soldier I get to work alongside, I still need to prepare myself for a career following the military. After a great deal of research, I selected the UF MBA Online two-year hybrid program based on the program’s exceedingly high ratings and blend of distance and in-person learning. I decided that it was the perfect program for me. I could still get the socialization and integration of an in-person class once a term while continuing as an active duty member of the Air Force. So far, my experience with the UF MBA Online program has been nothing short of outstanding. I attribute the fantastic experience I’ve had to the other members of my team and the amazing faculty who have been so accommodating. 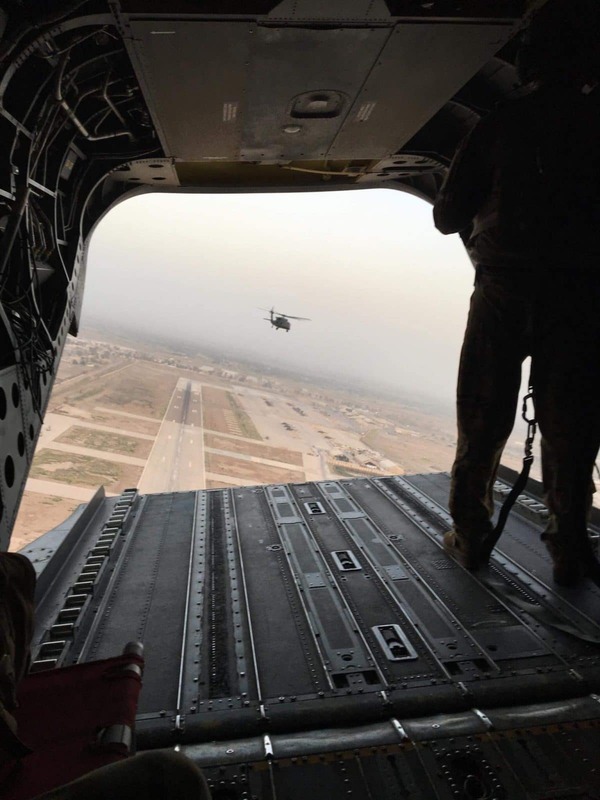 A view from the back of a CH-47 Chinook helicopter of a UH-60 Blackhawk over Iraq. Photo by Patrick Brennan. While at my home unit in New York, my situation is not much different from the other members of my cohort. That being said, I have been deployed to the Middle East for the past six months, so I have had to miss two consecutive class weekends in Gainesville. I have taken my finals on a different continent with my commander as a proctor and worked with my professors each term for course materials. On one occasion, I was forced to ask for a week extension on my finals due to being stranded in a remote part of Syria, which my professors willingly afforded me. I am seven hours ahead of East Coast time, which can make meetings with my team-mates extremely challenging. Not to mention the fact that I can be traveling around Syria, Iraq, Jordan and Kuwait for days at a time, meaning that I need to accomplish my coursework and studying in bursts. My teammates and I must have strong, constant communications, so that they can anticipate when I can’t contribute to a project or participate in a discussion, and so I can complete my portions of assignments in advance. So far, they have been amazing, and we have managed to meet all our obligations as a team. Even though I am so far away, and my schedule is so unreliable, over the past ten months of the UF MBA Online program I feel as though I’ve really managed to make lasting and powerful connections with members of my team and cohort – the kind of connections that last a lifetime, having been formed under challenging circumstances. I am scheduled to graduate the UF MBA program in March of 2020. My future, currently, is still somewhat uncertain. I intend to remain in the Air Force even though I am eligible to retire, as I want to ensure that I have a stable career through the time I earn my degree. My goal is to focus in finance and find a job in the Central North Carolina area where I own a house. For me, the location is ideal – three hours from the coast, three hours from the mountains, and New York and Florida are a day’s drive away. I have no doubt that with an MBA from the University of Florida and the aid of the Business Career Services team, I can easily transition from a life-long career in the Air Force to the world of business. Less than half of the way through the program I have already learned so much. I can only imagine what the next 17 months has in store for me to prepare me for that transition. I cannot overstate how thrilled I am to be a part of the UF MBA program. I highly recommend it, not only to active duty military members, but also anyone with a career that constrains their attendance in a traditional MBA program and wants to take themselves to the next level. The extremely high quality of the cohort, the knowledge and willingness of the faculty to go above-and-beyond to assist and the challenges of the course material make this program everything I wanted it to be.